When the signal is the same shape and magnitude as the corrections involved, you’d better check your corrections. Even if you’ve seen it before, give her article a read linked above. If you haven’t seen it, you need to. This entry was posted on June 26, 2009 at 4:51 pm	and is filed under Uncategorized. You can follow any responses to this entry through the RSS 2.0 feed. You can skip to the end and leave a response. Pinging is currently not allowed. Were the corrections corrected from F to C when taken out of the Global Data set? Why extrapolate the US adjustments (which the USHCN is) to the globe? 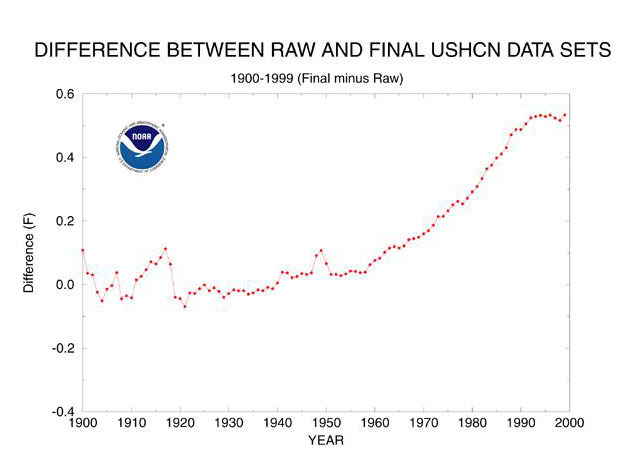 Why use NOAA’s adjustments to get the raw GISS data? Jeff is this a project for you / CA / WUWT / etc to take on? Interesting post, but I feel Michael Hammer’s analysis is not thorough or precise enough. It looks like the kind of post that can give skeptics a bad name with some justification – if it is ignorant of key issues. For instance, commonsense tells me that the TOBS correction could be reasonable whereas all the others look questionable – but the original paper does not clarify this so the science is not transparent “open source” like we need in Climate Science. So Michael Hammer’s reaction is understandable – but we have to do better IMHO, to set / challenge the standards in ways the old school cannot legitimately dismiss. Also my red light goes on when I see that most correction procedures were fingered by Tom Karl. Maybe these are stupid remarks made by an amateur scientist who doesn’t know what she’s talking about. I believe it is well known that the adjustments for the US temperature anomalies have been in the direction to make them more positive over time. I do not believe that the proper approach to discussion of these trends is to simply label them as artifacts without providing some counter evidence. The problems with adjustments is that, if there are biases in searching for adjustments, the adjustments made could all be legitimate but the adjustments not found (for lack of interest or biases) in the other direction that could counter balance those found will not be made . 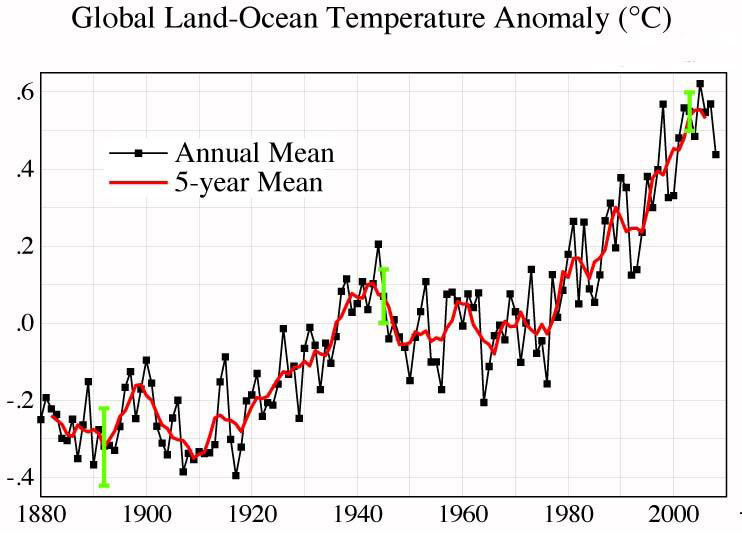 To me the more damning evidence is produced by the various temperature anomaly series we have for the US that can be shown to be statistically different. It certainly is counter to the claims of the data series producers who tend to play down the differences while at the same time making claims of small confidence intervals. Recently the USHCN went from Version 1 to Version 2 for their US temperature reporting stations with Ver 2 depending more on mathematically determining change points in the series for making most of the adjustments. The claim was made that over the long term the versions were different (otherwise why change) but not by much. 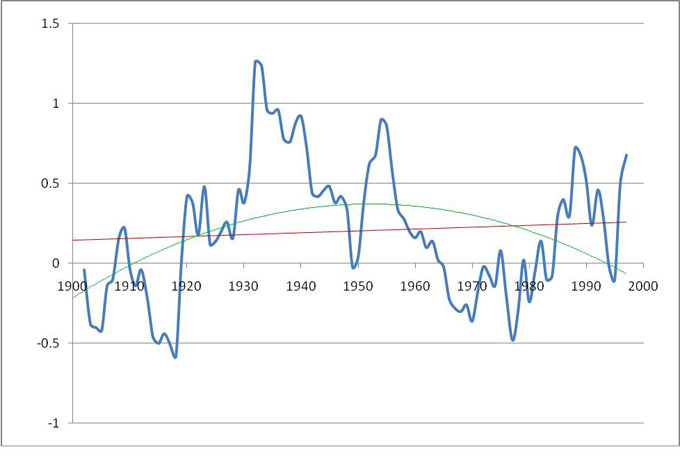 If you have ever looked at the long term US temperature series you will have noted much missing data prior to about 1920. When I compare data series for the US, I like to start with 1920 and in the case of station data include only those with complete sets of data. When I made such a comparison between Ver 1 and 2 I obtained the results listed below. I did this by looking at the Ver 1 and 2 differences for each of 1073 stations with complete sets of data. I report the average difference for Ver 2 – Ver 1 (note that it makes the trend more positive) the standard deviation of the differences and the t value for the difference statistic. Also note the differences at the extremes of the range and how different they are in terms of degrees C per decade. I find those differences even more troubling than that for the overall trend. The point here is that Ver 1 was used for many years with claims for its accuracy but yet now the same people are claiming a new improved version which I find statistically different from 1920-2006 and thus showing that these temperature series are not cast in concrete. When the GISS version and the Ver 1 USHCN data are similarly compared there are differences in trends of approximately 0.02 degrees C per decade with the USHCN Ver 1 having the more positive trend. I also recently reported a significant difference in trends for the GISS series using 250 and 1200 km smoothing for the global zone from 20S to 20N at CA but was not able to get any discussion of the results. In my mind, it is an important start to look at these series differences and potentially more productive than simply pronouncing that the currently used adjustments are artifacts. Lucy – adjustments are not data. Adjustments must also not be confused with calibration. If, because a site changed it’s time of observation, you are worried that this has biased the data after the change, up or down – well, then you can worry about it. Don’t use the data – use it in ways that are insensitive to such changes, or just note it as a possible source of uncertainty when publishing products based on the data. One cannot scientifically justify adjusting the data before or after the time of observation change in order to say “we think this is what it would have been if the time of observation was X during the entire period”. Such adjustments are speculation, not data. If all that was recorded was the min/max for a 24 hour period before 8AM in the morning – all you know is the min/max for that time period – nothing more. Interesting to see Steve’s new post at CA all about USHCN adjustments. Looks like the scent is in the air. I’d like to see Tom Karl’s adjustments work nosed out.